The nomenclature for the neurological manifestations of Borrelia burgdorferi infections is confusing and not uniformly used. In the literature, the terms used include Bannwarth’s syndrome (Meyer-Rienecker and Hitzschke 1977), meningopolyneuritis Garin-Bujadoux-Bannwarth (Hörstrup and Ackermann 1973), Borrelia meningitis (Hansen et al. 1986), erythema chronicum migrans meningitis (Weber 1974), radiculomyelomeningitis after tick bite (Schaltenbrand 1962), meningomyeloradiculitis after tick bite with erythema (Bammer and Schenk 1965), neuroborreliosis (Stiernstedt et al. 1988), and Lyme neuroborreliosis (Halperin et al. 1989). In addition, these terms confuse the neurological manifestations during the early disseminated infection and those in chronic late infection. All these terms have disadvantages; for example, Bannwarth’s syndrome is characterized by painful meningoradiculoneuritis (Bannwarth 1941). Use of the word “meningitis” is not advisable because, despite the inflammatory cerebrospinal fluid (CSF) syndrome, patients in Europe usually do not suffer from the typical signs or symptoms of meningitis such as headache, stiff neck, fever, vomiting, and photophobia. The term “neuroborreliosis” is nonspecific because other borrelial infections such as relapsing fever may also cause neurological manifestations. 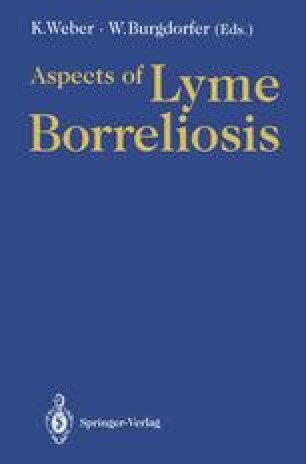 Thus, the term Lyme neuroborreliosis seems to be most suitable to describe the neurological manifestations of B. burgdorferi infection including early and late manifestations.